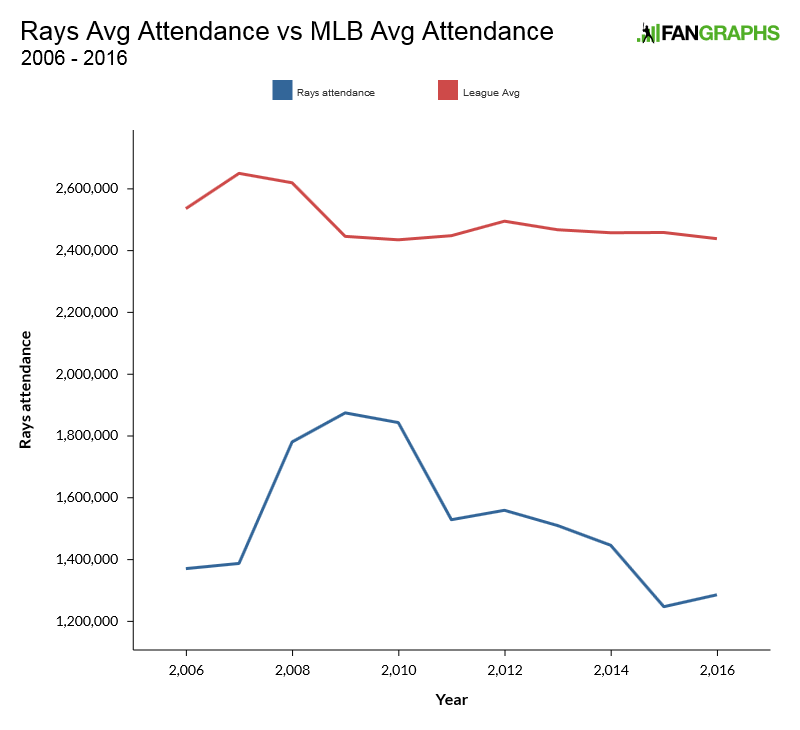 Can the Rays Ever Achieve League-Average Attendance? This is Michael Lortz’ third piece as part of his June residency at FanGraphs. Lortz covers the Tampa Bay baseball market for the appropriately named Tampa Bay Baseball Market and has previously published work in the Community pages, as well. You can find him on Twitter, as well. Read the work of all our residents here. In my recent interview with Rays President Brian Auld, he stated that a goal of the Rays’ front office was to reach a league-average annual attendance mark. Last year, MLB average attendance was approximately 2.4 million per club. Rays attendance was 47% below that mar. Since Stu Sternberg bought the team in 2005, the Rays have never been close to league average. The closest they’ve been is 23% below in 2009. And the following table illustrates how far the Rays have been from league average since Sternberg bought the team. That’s obviously not encouraging. On the other hand, does it make sence for the Rays to set even the modest goal of “average” in a universe that includes major markets such as Chicago, Los Angeles, and New York? Since 2006, the Dodgers and Yankees, for example, have never been lower than 20% above league average in annual attendance and have been as high as 64% above average. The biggest markets in Major League Baseball skew the average for less populated areas such as Tampa Bay. Those teams would have to severely struggle over an extended amount of time to be anywhere near league average. The Rays would be better off setting goals relative to teams in similar markets. According to the new Collective Bargaining Agreement, there are three market-size brackets that dictate revenue sharing. The largest 13 markets do not receive any shared revenue. The smallest 15 receive shared revenue. Reports cite three “classes” of teams: large markets that pay, medium markets that neither pay nor receive, and small markets that receive. While I don’t know the formula Major League Baseball has used to reach their outcomes — on a scale of 1-100, the Yankees were a 235 — we do know it is a mix of population, income, and cable households. In 2017, Tampa Bay was 18th in population, 13th in television market size (but last in TV revenue), and bottom five in regional personal income. Fair to say, the Rays remain a recipient of revenue sharing. Heres how the Rays’ attendance compares to these teams’ combined average attendance since 2006. In 2010, the Rays nearly drew an amount equivalent to the small-market attendance average. Although the team would like to be above average for their size, 2010 and 2009 could be considered successful from an attendance perspective, especially considering the Rays’ other obstacles, such as distance from the center of population. Interestingly, the most average small-market team during this time was the Baltimore Orioles. 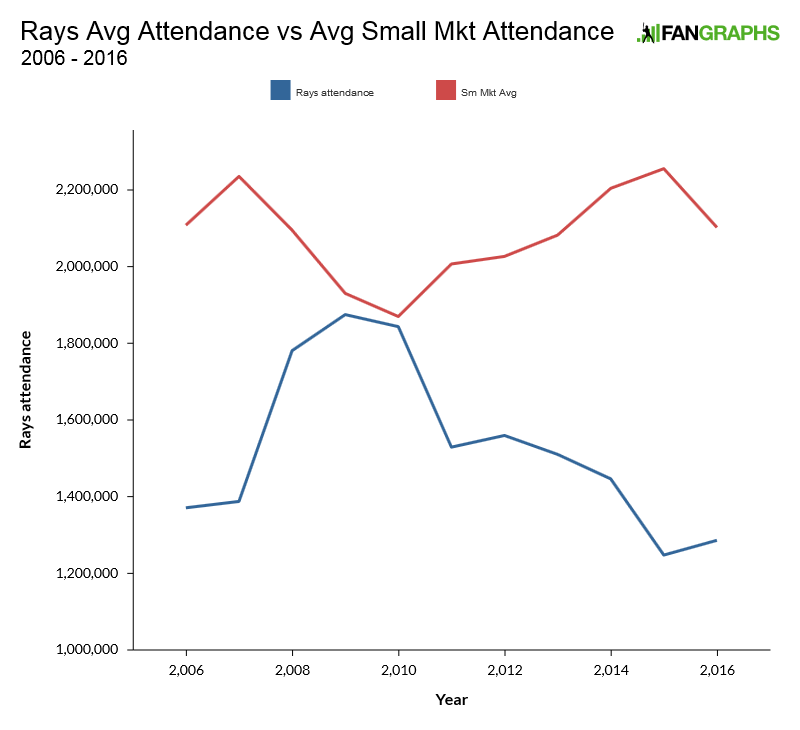 Only three times between 2006 and 2016 was the Orioles attendance more than 10% above or below the small-market average. During the Rays’ most successful years on the field, they averaged 90-plus wins. Other teams with fan representation in Tampa Bay – the Yankees and Red Sox – also averaged 90-plus wins, which lead to larger crowds for division games. While Boston and New York are working their way to the top the AL East, the Rays are sitting at roughly .500, and as I covered a few weeks ago, attendance against rivals has decreased considerably. There is no doubt that the Rays would see an attendance spike if they moved to a new stadium in Tampa Bay, wherever that stadium may land. According to Christopher Clapp’s often-cited paper, the average “honeymoon” spike is between 32-37%. JC Bradbury recently tweeted a new average of 12%. With the current team and current attendance trends, adding 32-37% for a new stadium would place the Rays just below average small-market attendance for the extent of the honeymoon effect. With a better team and a new stadium closer to the center of Tampa Bay’s population, the Rays may be able to sustain or exceed the average small-market attendance. That, along with a new TV contract, would help with revenue and in turn, aid payroll, which may add to talent depth, and possibly equal more wins making the Rays more long-term competitive. Maintaining the small-market average wouldn’t mean that the Rays would overtake Los Angeles or New York, nor would it help club reach the front office’ current dream of MLB average attendance, but it would be realistic and attainable. There is no shame in being average amongst peers. We hoped you liked reading Can the Rays Ever Achieve League-Average Attendance? by Michael Lortz! Michael Lortz is a business consultant in the Tampa Bay area. He writes about the business of Tampa Bay baseball on his site: TampaBayBaseballMarket.com . He can be reached at @tbbaseballmkt or his personal @JordiScrubbings . I’m old enough to remember when teams played in those old concrete multi-use stadiums like Candlestick, Jack Murphy, and 3 Rivers and attendance was horrible. Compare the Giants attendance at Candlestick to now, it’s night and day. I think a new nice stadium would make a huge difference for the Rays. 3 Rivers and Riverfront were THE EXACT SAME STADIUM, god they were awful. I’m a Dodgers fan and I remember watching road games as a kid in the 80s and thinking all the road teams played in the exact same stadium. Candlestick, Jack Murphy, 3 Rivers, Riverfront, Veterans, Fulton-County, and the old Busch Stadium were all the same. The only thing that made the Astrodome and Olympic Stadium stand out were the roofs. And this was before interleague play but I assume the AL parks had the same problem (Back then you stuck to one league). I know the old pre-renovation Angels stadium was a concrete monster.